Buy this item and earn 1,099 ClubPoints. 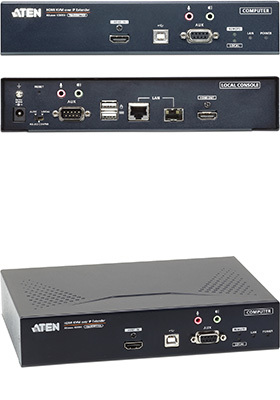 ATEN KE8950 4K HDMI KVM over IP extenders/matrix bring together a unique blend of features and new technologies that offer the ultimate solution for extending computers to consoles on or off your IT infrastructure. Utilizing expertise in over IP KVM solutions, KE8950 are IP-based HDMI KVM extenders that allow access to a computer system from a remote USB console to anywhere over an intranet. 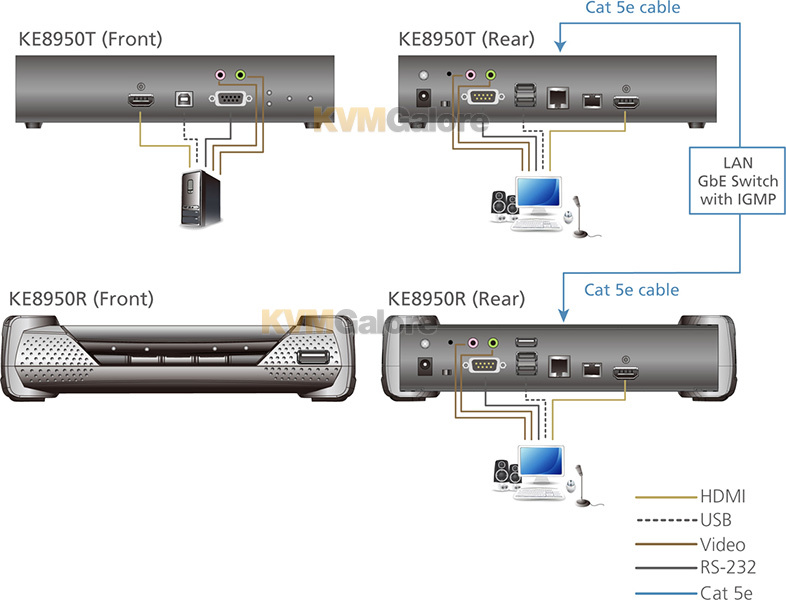 KE8950 KVM over IP extenders support one HDMI monitor at each end, providing a greatly improved video display image with 4K x 2K video resolution (up to 3840x2160). KE8950 extender consist of a Tx (Transmitter) that connects to a computer and a Rx (Receiver) unit that provides console access from a separate location. The computer is accessed from the remote console via a standard TCP/IP Gigabit network or direct CAT-5e/6 cable connection. This is perfect for any installation where you need to place the console where it is convenient, but you want the computer to reside ina asecure location - away from the keyboard/mouse and display. KE8950 also support 1Gbps SFP fiber module expansions (sold separately), enabling connections via fiber optic network to extend distances in transmission. KE8950 extenders have a local on-screen display (OSD) system on the Receiver end to configure both units for easy setup and operation. Both Transmitter and Receiver units have RS-232 ports to to a serial terminal for configuration or serial devices such as touch-screen and barcode scanners. Implementing the KE Matrix Management Software (CCKM) with KE8950, IT administrators receive advanced features functioning as auto detection of all KE series extenders* on the same subnet for the sake of fast installation or configuration, username/password authentication and authorization, and the ability to define different types of connections that can be switched and shared. ATEN's advanced graphics processor delivers video that ensures you to experience the same vivid and sharp image quality on the remote monitor no matter how far away the console is located. Remarkably, KE8950 / KE8950 offers Ultra High Definition (UHD) video quality – up to 3840x2160 @ 30 Hz (4:4:4); 24-bit color depth. 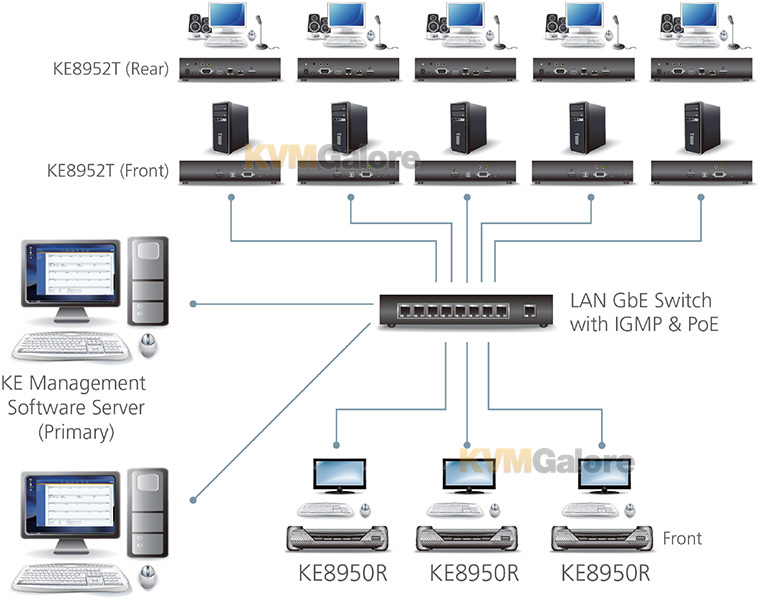 KE8950 / KE8950 allows you to access, share, and switch full control of Tx (Transmitter) connected computers - from any Rx (Receiver - KVM console) on the network. Flexibly allows one-to-one, one-to-many, many-to-one, or many-to-many computer to KVM console connections. 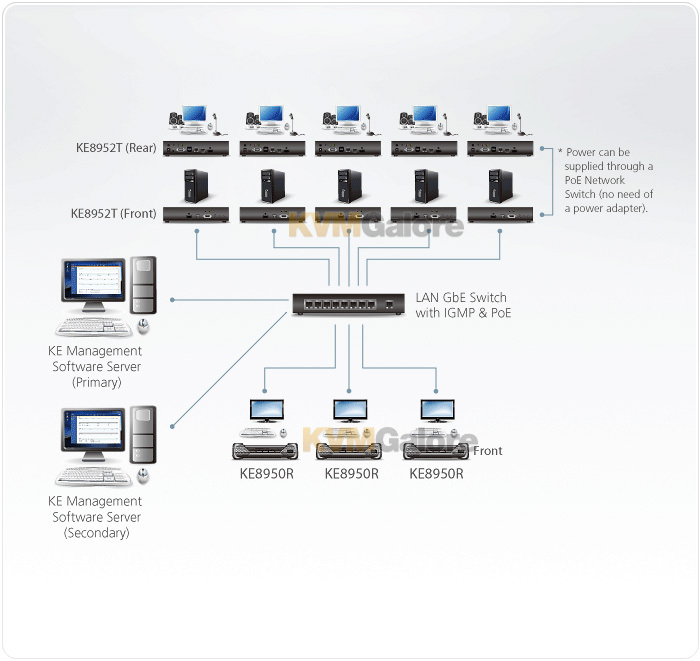 The KE Matrix Management Software allows you to easily administer all KE8950 / KE8950 devices over a network, using an intuitive user-friendly web based GUI. 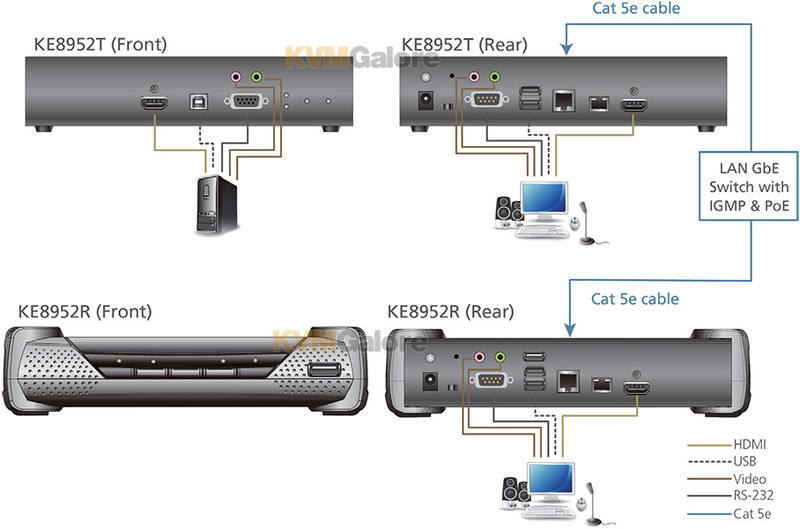 Listed below are additional products to consider which are compatible with KE8950T. These items may be required to complete your system.